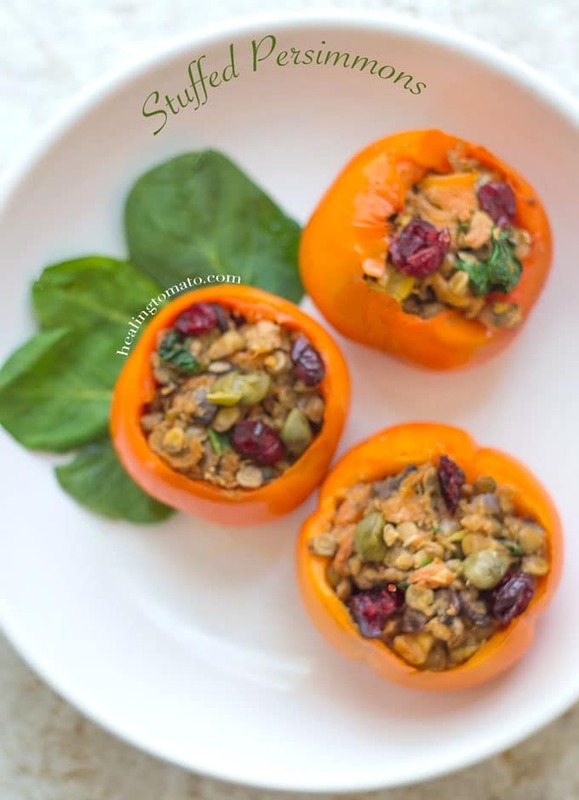 This savory stuffed persimmon recipe is the perfect side dish or quick lunch recipe. 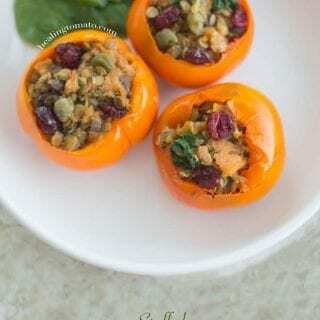 The persimmons are stuffed with lentils and cranberries. 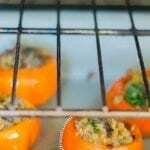 I love Roasted persimmons because they have a delicate and smoky flavor. This is only the second time in my life that I have tried Persimmons! When I first tried them, it was sweet and delicious. I saw myself getting addicted to them because they taste similar to cantaloupes. Can you eat the persimmon’s skin? 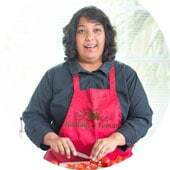 – Most chefs like using Hachiya in jam recipes or even bread recipes. I have tasted a hachiya foccacia before and it was so goooood! I haven’t be able to recplicate it. However, I have perfected the strawberry foccacia. – In the US, only these two types of persimmons are sold. Other varieties include chocolate persimmon, Sharon fruit and Tanenashi. 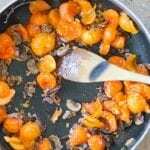 In this recipe, I use the Fuyu Persimmon which are sweet and soft. They are sturdy enough especially for a savory recipe. Their slight sweetness makes them the perfect companion to lentils and ginger. Both these ingredients are used heavily in this recipe. So, how do I pick Fuyu persimmons? I have found that their skin color is the best way to tell the juicy from the un-ripe. – The darker orange hue means that they are the peak sweetness level and ready to eat. – They also are soft to the touch. 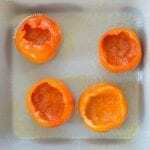 – A lighter orange color just means that they need time to ripen. If you have a bunch of light orange persimmons, the fastest way to ripen them is to put them into a brown bag and place them in the dry, dark corner. They should ripen in a day or two. Their skin is edible, but, I see most people peel it. Personally, I loved keeping the skin on, especially when roasting them. They cook more evening and they hold their shape when stuffed. If you want to peel the skin, potato peeler does an amazing job. You can put the skin into your rose garden or compost them. I had no idea that Fuyu persimmons were known as Japan Persimmons, even though they originated in China. They are becoming really popular now because of all the creative recipes popping up online. Martha Stewart has a collection of recipes that use it. 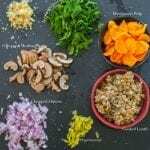 I want to try it in a salad recipe next time. 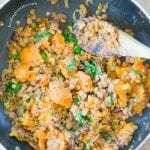 They have little fat and have a huge amount of Vitamin A and C. I also stuffed persimmons with a mix of red lentils and regular lentils, mostly because I didn’t have enough regular lentils to stuff 4 persimmons. 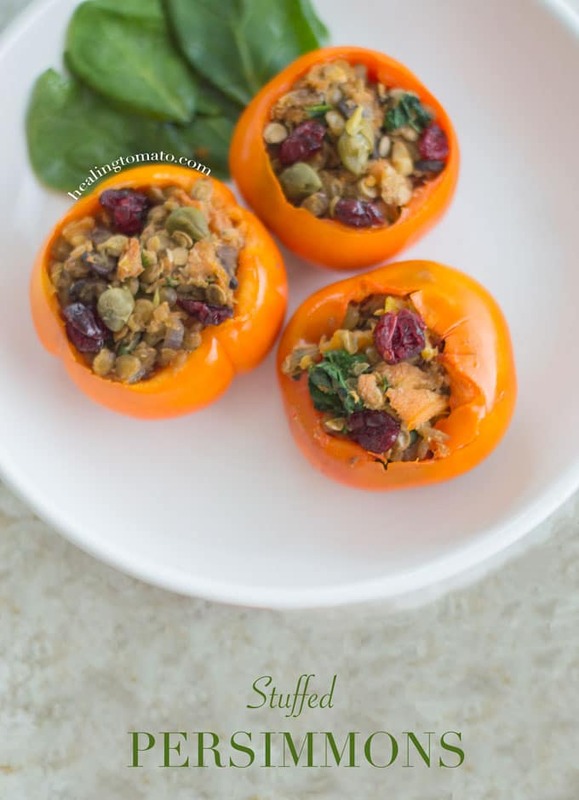 You can choose only the lentils or both in this stuffed persimmons. The ginger is a nice offset to the sweetness of the persimmons. It added a nice spice level to the whole recipe. 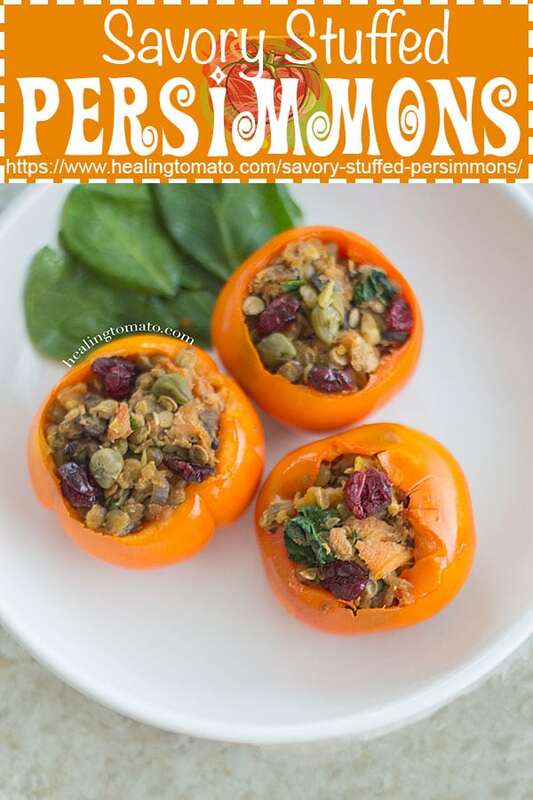 Even though the coconut water is optional in this recipe, I highly recommend it because it really brings all the flavors together in this persimmon recipe. 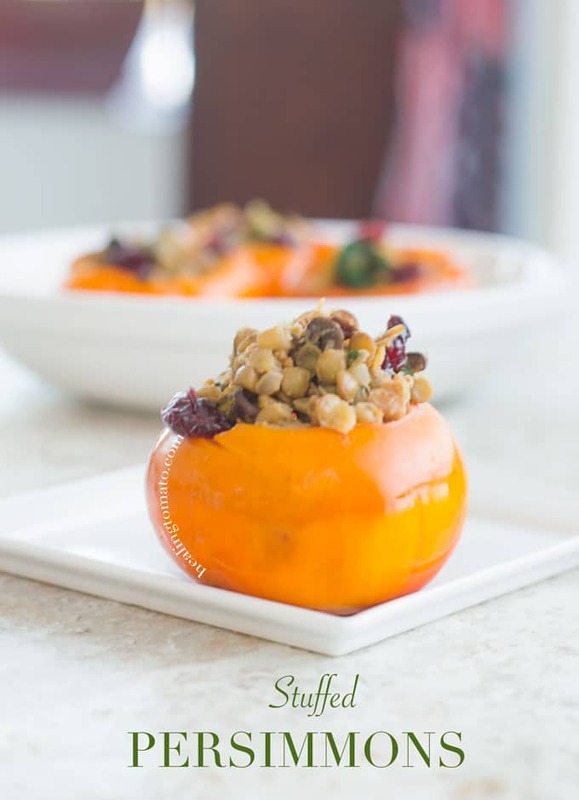 What’s your favorite way to eat persimmons? If you like stuffed recipes, try my stuffed shells recipe. Its beyond delicious. Related: Have you tried my broccoli veggie dippers with lentils? 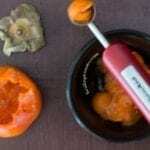 Cut the tops of the Persimmons and scoop out the inside using a melon baller. Save the insides. 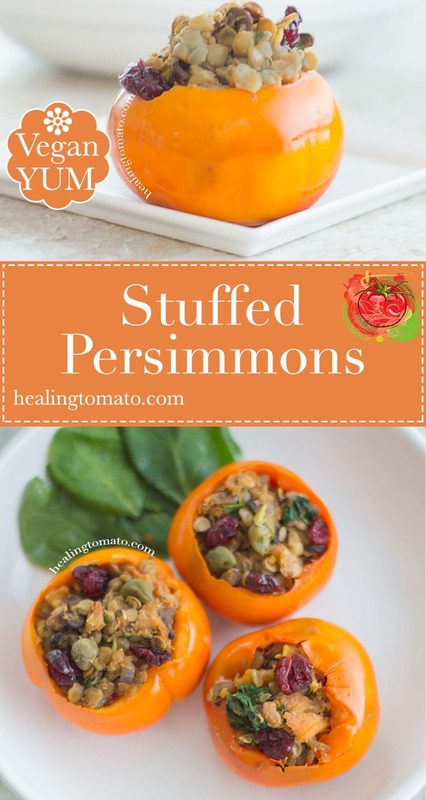 I’m so glad you’ve embraced persimmons, I just love them! 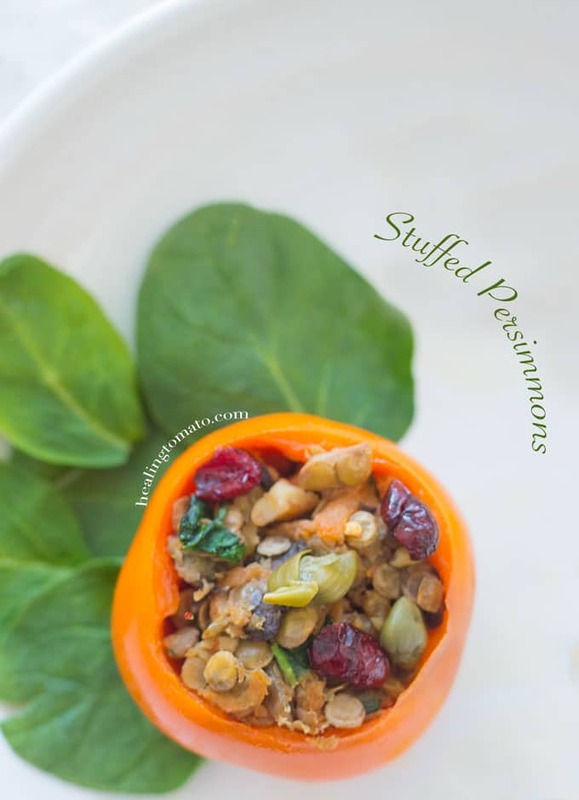 Stuffing them here is brilliant, the combination looks just fabulous – can’t wait to give this a try!